New York has a vocational and trade school system extensive enough to suit the needs of its large and diverse population. Secondary and post-secondary students alike can get career and technical training across the state, whether through traditional high schools, career academies, community colleges or other institutions. This helps prepare New York’s students for high-skill, high-wage jobs in the state’s top-employing industries, like healthcare or arts and entertainment. Read on to learn more about career opportunities and vocational and trade schools in New York. The following rankings serve as a detailed outline of the vocational and learning options available in New York. In addition to vocational and trade schools, many students attend community colleges, where they choose to enroll in hospitality, construction or healthcare related programs. In order to help you choose the right school, our rankings of accredited New York schools take into account numerous factors, including tuition, student-teacher ratio and financial aid options. Monroe Community College prides itself on offering over 100 programs. The two-year associate programs span across a variety of sectors. Students can learn just about anything, from addictions counseling to interior design to public safety communications. The school offers three types of degrees, but the associate in applied science and associate in science degrees tends to be focused on job-related courses and program offerings. The associate in applied science tends to cover more highly technical fields, like computer systems technology and nursing. The associate in science covers some job-related fields, like commercial art and illustration. Both programs give a solid base in general education requirements, along with job-specific courses. At Niagara County Community College, students can select from several categories from which to learn: business, technology & the arts, hospitality, tourism & the culinary arts, humanities & social sciences, nursing & allied health and science, health & mathematics. All of these categories offer several associate programs in different areas of specialized study, from human services to nursing to brewery operations. Students receive a well-rounded general education where they can choose five courses out of eight knowledge areas like other world civilizations, foreign language, natural sciences and western civilization, as well as courses related to their chosen career. Mohawk Valley Community College offers dozens of two-year associate programs across different vocational tracks. The degrees offered fall into several designations. The AOS degrees are what focus on traditional vocational tracks like welding, culinary arts management and computer-aided drafting. In most vocational programs, students start their job-related courses in the first semester of the program, with just a few general education courses over the whole program. Other degrees are also geared towards leading students to a job after graduation, like the respiratory care AAS degree. Many of these programs will allow students to take any certification licensing that may be required to enter their field. At Tompkins Cortland Community College, students can enroll in a number of AAS degrees that will prepare them to enter the workforce upon graduation. The school has some unique programs, like wine marketing and entrepreneurship. Some programs grant job training through required internships. Students typically start courses related to their profession within the first semester, with a few English classes and electives. Students who need to take licensing exams, such as those enrolled in the nursing degree, will be prepared to do so upon graduation. The full-time programs typically run through four semesters. Specialized education is offered at SUNY Broome Community College through one of their associate of applied science degree programs. Typically completed in two years, these programs are designed with the career-oriented student in mind, allowing them to gain valuable knowledge that will aid in their career pursuits after graduation. Students who wish to complete their degree faster may also enroll in online, weekend, summer, and winter classes, all of which provide the same comprehensive education as traditional courses. If students feel they aren’t on the right path to graduation, they have the option to meet with one of SUNY Broome’s many highly trained academic advisors. New York has career and technical education (CTE) options for students seeking higher education as well as those still in high school. At the secondary level, New York offers vocational training at comprehensive high schools, CTE-specific high schools and career academies, which can be either standalone institutions or school-within-a-school style. Vocational education may even be offered through career centers via Boards of Cooperative Educational Services. Post-secondary students can find vocational and trade schools in New York’s two public college systems: State University of New York (SUNY) and City University of New York (CUNY), while Educational Opportunity Centers provide career training for adult learners. Prospective students can use this search tool to help them find vocational and trade schools in New York. Career and technical programs in New York high schools are only approved if they can articulate to post-secondary education opportunities, meaning that students can be sure that their courses count. New York City alone has 49 career and technical high schools within its boroughs. Staten Island Technical High School and Brooklyn Technical High School both earned gold rankings by U.S. News and World Report. 92.3 percent of post-secondary students in New York met the technical skill attainment core indicator for CTE in 2013-2014. In New York, high school vocational programs must be able to transfer credits to post-secondary institutions, which may explain why only 4.3 percent of New York’s vocational and trade students earn less-than-one-year credentials. More popular are associate’s degrees and one-year certificates, which can be earned at high schools with CTE offerings, career academies and state and city colleges throughout New York. The table below shows how credentials earned by students in New York compare with those earned nationally. New York’s largest private-sector employers represent a variety of industries. At the top is Columbia University, followed by Home Depot, JPMorgan Chase Bank, Montefiore Hospital and Medical Center and Mount Sinai Hospital. Similarly, New York’s careers with the most job openings for those with some college and those with associate’s degrees come from a range of industries, including healthcare, education, cosmetology, and the legal sector. New York City is home to a slew of private, for-profit vocational and trade schools, as well as two public post-secondary schools that serve the area. CUNY Borough of Manhattan Community College and Stella and Charles Guttman Community College offer a variety of associate degree programs and a handful of certificate programs to post-secondary trade students in the city. Secondary students have a few more options for their vocational and trade educations. New York City has 49 CTE-specific high school within its boroughs, and students can get CTE through traditional high schools as well. Three of the state’s largest employers within the private sector are also among New York City’s top five employers. Columbia University (1), JPMorgan Chase Bank (3) and Montefiore Hospital and Medical Center (5) join with Consolidated Edison and Memorial Sloan Kettering Cancer Center to comprise New York City’s top job suppliers. These employers as well as many others in the hospitality and tourism, arts and entertainment, and transportation sectors lead to ample job opportunity for vocational school graduates with training in these fields. Comprehensive resource for students interested in learning more about CTE programs within New York City. Includes CTE overview, school and program information and CTE news. Official government site for CTE programs within New York City’s school system. Has information for students and parents, including articles and research on CTE, available schools and programs and news and events. An association for the promotion, support and development of CTE throughout New York. 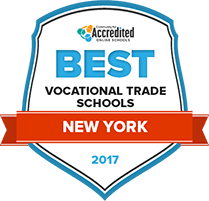 Provides an overview of New York’s vocational and trade education and information on meetings, news and other resources related to CTE in New York. Provides information about the state’s CTE programs, including programs of study, enrollment and assessment data, learning standards, career plans and funding information. State labor and workforce website. Provides data and research on New York’s labor market, economy and employment projections as well as resources and information for jobseekers and employers. Job openings and advice for New York City residents seeking vocational careers in the city.